Although I watched The Hobbit: The Desolation of Smaug last Friday, it has taken me quite a few days to write up my comments. Mainly this comes from the sheer difficulty of comparing the visual effects in this film with the earlier An Unexpected Journey that I last saw in the cinema almost 12 months ago. In particular, I’m talking about the 48 frames per second higher frame rate (HFR) that has been the technological distinction point of the Hobbit trilogy. When An Unexpected Journey came out last year the HFR was set to solve many of the visual artefacts that had been plaguing 3D cinema since its digital reincarnation in the early 2000s. However it quickly garnered criticism for making the film look ‘too video,’ ‘too HD’ and even ‘too real.’ I loved it and hated it. Close-ups had intense spectacular detail that combined with stereoscopic effects to produce an overwhelming sense of the film’s presence in the auditorium while light dispersion around characters and objects produced strange, ugly contrasts that often flattened them in mid and wide shots. 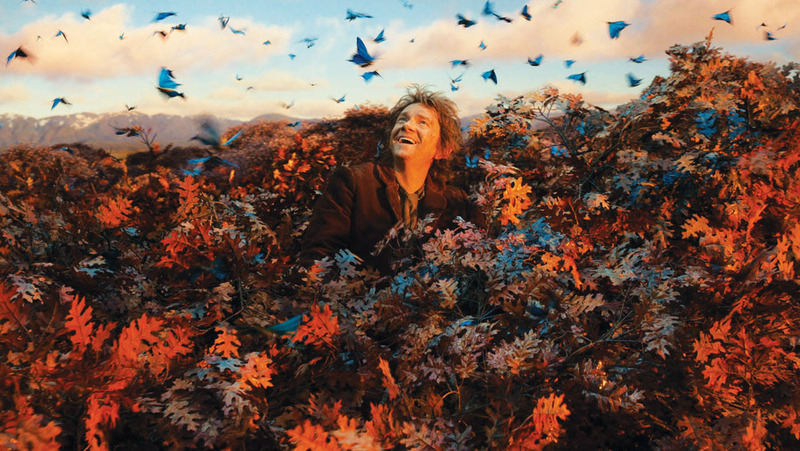 When watching The Desolation of Smaug last week, I found the eye-opening and delightful difference of the first film’s visual effects were completely absent. On the one hand this poses a philosophical question about how we remember and evaluate subjective visual experiences. Had I simply become used to HFR, having watched an entire film already; have I watched so many 3D films in the last 12 months that I can no longer be mesmerised by stereoscopic effects, even if they are in HFR; or was I so tired of watching dwarves caper around Middle Earth that I couldn’t be bothered focusing my attention on the visual details? On the other hand it asks us to pay careful attention to the way new visual technologies are implemented. Evidence from director Peter Jackson has stated that he changed the use of HFR on the second film in order to ‘improve’ the use of HFR. In his words, “When I did the color timing this year, the color grading, I spent a lot of time experimenting with ways we could soften the image and make it look a bit more filmic. Not more like 35 mm film necessarily, but just to take the HD quality away from it, which I think I did reasonably successfully.” Although Jackson is convinced that this allowed him to retain the strengths of HFR, I wonder if it diminished the sharpness and clarity that made the close-ups in the initial film so stunning. For example, the MGM Lion that appeared prior to An Unexpected Journey’s credits was the closest I have ever felt to being in the same space as a live animal during a film. However, the same MGM Lion prior to The Desolation of Smaug looked only slightly more stereoscopic than the MGM Lion in front of most MGM films. This suggests to me that the HFR has been toned down too much via the Pro-Mist colour diffusing tool that Jackson describes using. However, before I speak too soon, I am open to the possibility that someone who has worked on the film will tell me that the Lion is exactly the same in both film, leading me back to the conundrum of subjective visual memory that is making it so hard to evaluate how the different films operate (ideally a cinema will show both films in HFR back to back at some point). An aspect that exasperated this, particularly in the opening scene, was the use of pans and mobile cameras that, while working well in traditional cinema, become cheesy and overemphatic in HFR 3D. In this type of shot, the cameras appear to take on a more subjective position as the precise movement of their motion suggest a living, moving observer. Although this could be used to great effect in point-of-view shots, it clashes with the intended omniscient observer set-up by Jackson’s relatively classical visual storytelling. This problem returns throughout the film as Peter Jackson is worse than James Cameron for refusing to allow the cameras to stay still. Rather than letting audiences soak in the visual details of shots or explore the stereoscopic depth relations between objects, the film continuously sweeps and soars around. Furthermore, the difficulties Jackson’s team faced when trying to combine actors of the same size when they are playing characters of radically different sizes (dwarves and humans for example) becomes apparent. Often the cuts between different shots bring with them changes to spatial planes but rather than seeming to show a new angle on a scenario they seem to show a completely different space. To an extent this is hidden by extensive use of pulled focus but this aspect, like the soaring cameras, only goes so far in hiding new problematic artefacts created by HFR. The result is a glimpse at the potential for a spectacular visual field but one that is not brought to fruition. As with the previous film, the close-ups are much more effective and show the potential for digital 3D to create stunning details that cannot be seen elsewhere. This is particularly true when the heads of evil creatures such as wolves and a large black bear seem to hang into the auditorium and break the safe space between viewer and film. Throughout the film, the violation of space between audience and traditional screen film is very limited, in a way that is in keeping with An Unexpected Journey. The brief occasions when bees buzz around the auditorium and bluebird flutter towards the audience are the only really exceptional uses of negative parallax. However there are a few other instances when stereoscopic depth planes are used to good effect. 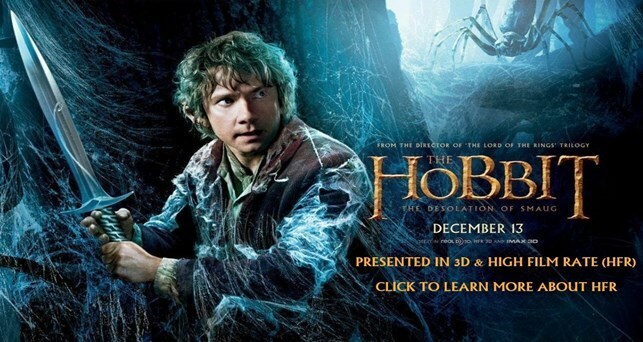 The first occurs when Bilbo and the dwarves are captured by giant spiders in the forest. Well known as the source of many phobias, the spiders are invoked firstly through their gigantic, encompassing webs. They produce a sticky yet transparent material that stretches towards the audience and as the cameras travel through them, they suggest uncomfortable sensations on the skin. Later, when the dwarves find themselves catapulted down a fast flowing stream in wooden barrels, the stereoscopic effects create a sense of shared, overwhelming liquid space in which the audience could easily slip under and become engulfed by the water. This is particularly true when the cameras position us half bobbing in and out of the water in the same way as the barrels. Lastly, when the dragon Smaug is awakened, the flows of coins that tumble off his skin seem to submerge the audience underneath them. A similar effect happens when he breathes fire towards the audience and at one point showers them with molten gold. In each case, these moments suggest the potential for 3D HFR to be tactile and engrossing in ways that cannot be achieved by other cinema technologies. However, these moments are relatively rare in the film’s almost 3 hour length. For fans of The Hobbit narrative this aspect may be welcome as it provides less distraction from the journey of Bilbo, Gandalf and the dwarves. 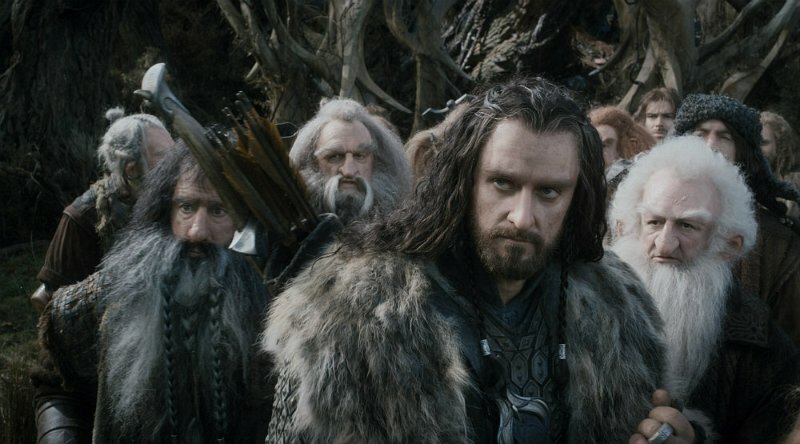 For someone like me, who finds the films mildly boring, the fascinating visual appeal provided by HFR in An Unexpected Journey is no longer there to provide welcome relief in The Desolation of Smaug.